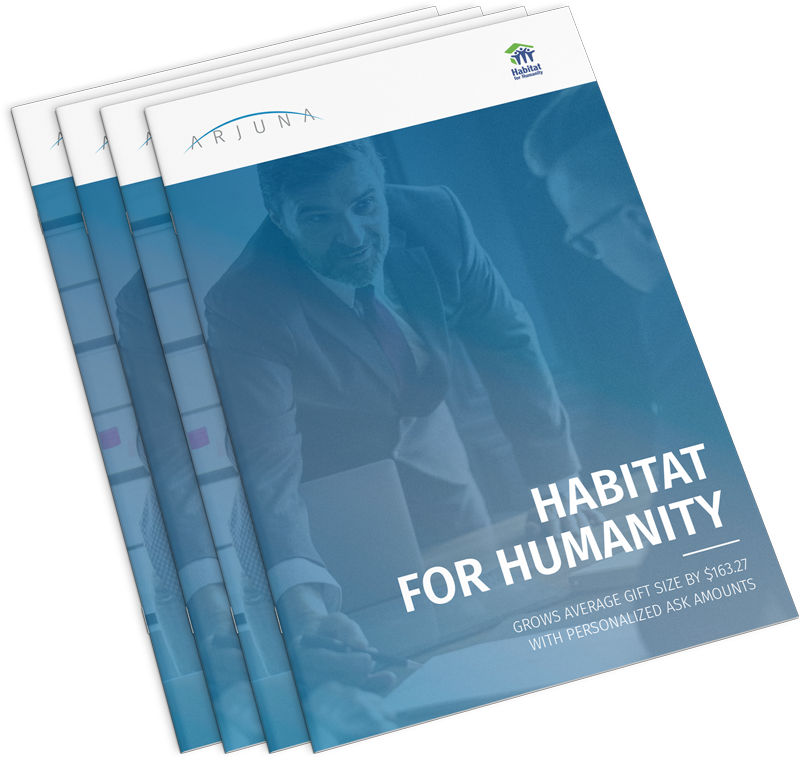 Arjuna Solutions has leveraged artificial intelligence and cloud computing services to deliver remarkable improvements in individual giving for its nonprofit clients over the past few years. Arjuna's ExactAsk A.I. platform has increased average overall individual giving by 19% in the first year of use and 72% during the second year of use while retaining valued patrons. Arjuna's formula is simple, they do not provide complicated artificial intelligence technologies to integrate with existing fundraising systems, they simply provide clients with the output of their algorithms – the individually optimized "Ask Amounts" to request of each individual donor at the optimal time. These individually optimized Ask Amounts resonate with donors more effectively than traditional broad categories of giving, as the amounts are better aligned with the actual value that the donor places on the work of the nonprofit agency. As a result, donors move their gifts to a more appropriate level of giving, and they remain at that point on the donor giving curve throughout their lifetime of gifting. Their donor pricing algorithm can be used in a wide variety of fundraising campaigns when executed through direct mail and email solicitations including: Renewal, Lapsed, Upgrade, Acquisition, Recurring, Special Appeal and End of Year Campaigns etc. There are minimal changes to existing fundraising workflows with ExactAsk, providing ease of use, maximum efficiency and very low cost of adoption for this sophisticated A.I. technology. This planner is an instrumental tool used in planning all Arjuna Solutions Engagements. We assess the input on this planner to identify the optimal Pilot deployment campaigns for our family of artificial intelligence solutions for nonprofit fundraising including ExactAsk to optimize Individual Donor Lifetime Value and ExactDonor to identify the optimal timing for individual donor solicitations. Please review the real-world experience that some of our clients have had with Arjuna's individual fundraising solutions. Register, email at info@ArjunaSolutions or call us today at 1-855-408-1313 to take advantage of our exclusive Pilot Promotional Program! Register to download Arjuna Case Studies and Pilot Planner now!